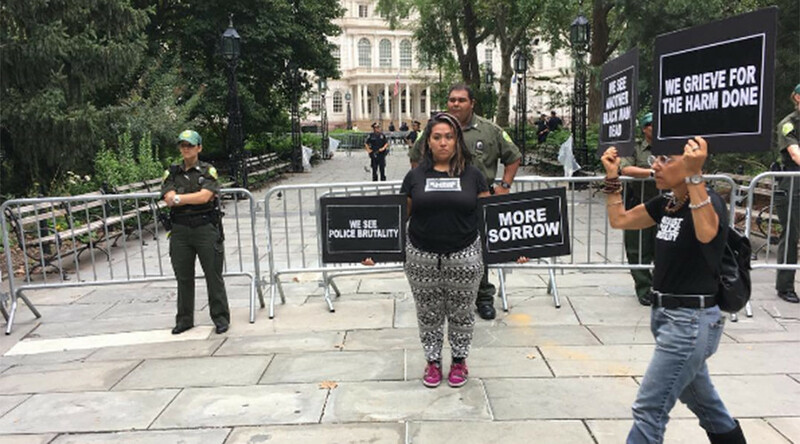 Protesters in New York City are hoping to force City Hall to shut down until the police commissioner is fired. Other demands include reparations for victims of police brutality and re-investing the NYPD's budget in minority communities. The all-day demonstration is being run by the Millions March NYC group, a spin-off of the Black Lives Matter movement. They are protesting against police brutality and a justice system that is not race-blind. They are also seeking reparations for the survivors and victims of police brutality, the money for which should come out of the NYPD’s $5.5 billion budget ‒ the remainder of which would be re-invested into minority communities. The group does not promise to remain peaceful. “It is time we escalate our organizational tactics against this racist system, which continues to execute Black & Brown people with impunity,” Millions March NYC wrote in a Facebook event for the Monday protest. The protesters plan to occupy City Hall Park and disrupt political figures and events. There will be outreach to the courts, education, training and other activities, along with a rally scheduled for 6 p.m. local time. The group hopes to have 1,000 protesters. The demonstration is part of a series of actions around the country on Monday.